Simon Roughneen in Moyale, Kenya-Ethiopia border. At least five million people are chronically food-dependent in Ethiopia, Africa’s second most populous nation. 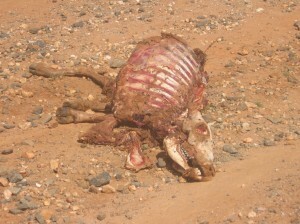 In the Somali and Oromo regions, failed rains mean failed water sources for animals and for people. Failed rains mean no pasture or foliage for the cattle, camels, donkeys and goats that people depend on for food and livelihoods. And although a little rain has fallen on the parched land, it is just that: a little. And the rains due for the next two months will likely be insufficient in any case. But the rain brings its own problems. A poisoned chalice poured from the sky, rain makes animals and people, already weakened from malnutrition, prone to diseases such as measles. And when rivers and lakes are watered again, malaria becomes a serious threat, and what is left of northern Kenya’s infrastructure has been threatened by flash floods. In Somalia – a non-existent state is prey to warlords and gangsters, making delivery of aid difficult at best and downright dangerous at worst. And recent weeks has seen dozens killed in cattle-raiding in northern Kenya, as resources are depleted and the stakes are raised for men with guns. And with pre-famine conditions rife in the drought-affected region, there is not much time left if another full-scale famine hits Ethiopia, and across the horn of Africa. The UN has launched a half-billon dollar appeal to deal with this crisis. The new Central Emergency Response Fund (CERF), a rapid-response emergency finance mechanism designed meet humanitarian needs quickly, has been mobilised. Ethiopia was isolated from the rest of Africa for much of its history. It is one of two African states (the other being the US-backed freed slave protectorate of Liberia) that escaped colonisation. It has retained a distinctive identity throughout history, with its own eastern Christian church, and a former royal dynasty that traces its lineage to the biblical King Solomon. The last emperor, Haile Selaisse, is worshipped by Rastafarians the world over as the leader to those of the Rastafari faith. He was seen as a living manifestation of Jah, the all-seeing and all-knowing God. His base of Ethiopia is classed as Zion, or Heaven on Earth, to those of the Rastafari faith. In 1896, at the Battle of Adwa, a 100,000 -trong Ethiopian army inflicted the first defeat in modern history by an African nation against a European coloniser, and the invading Italians were sent packing, to lick their wounds, until Mussolini defied the world in 1935. Ethiopia is going through a political crisis. Disputed election results from 2005 led to street protests, followed by a coercive military response that saw civilians and opposition activists being shot in a number of incidents last year. Ethiopia is the home of coffee – with its eastern district of Kafe reputedly the source of the name for western society’s favourite morning kickstart. Coffee plantations dominate the lush and temperate highlands in the west and centre of the country. But this is contrasted by the arid, remote, dusty and baking-hot southern regions. As you drive towards the Kenyan border, coffee plantations give way to some rugged pasture, and soon after, semi-desert bushland where crops cannot grow. The same applies as one moves north and east from the highlands – toward Somalia, and into the Tigray area bordering Eritrea, from where many of the ruling elites in Ethiopia hail. GOAL has launched an Africa drought appeal and is working in northern Kenya and southeastern Ethiopia to bring food to vulnerable people in advance of the next harvest season. GOAL is also working against chronic food shortages and malnutrition in Malawi, Niger, Zimbabwe, in refugee and displaced-person camps in Sudan and Uganda.